James Cameron's 'Avatar' has so far taken over two and a half billion dollars at the box office making it the largest grossing motion picture of all time. A film that plays to as great an audience as this across the world won't merely just reflect some of the fears and hopes of our cultures, it'll play a part in actually forming the ideas and feelings we have about ourselves and our world. So what does Avatar say about us, and what's it trying to say to us? On the face of it, it's as much a romantic political fable about the plucky underdog sticking it to the heartless, military-industrial Man as it is a hymn of praise to the virtues of spiritual and ecological awareness. So it's all good then? Well, I'm a sucker for Sci-Fi and war movies and so in some ways, of course, I couldn't help but enjoy it. Who could watch and not be impressed by such a vast and thrilling spectacle? Not me: it's a visually very impressive and compelling film. In a way though, I came away thinking, it's the very strength of Avatar that's a part of what made it disturb me so much. It puts forward its ideas about the world in an immensely persuasive way. So the form of its message is remarkable - but what of the message itself? The film seems to answers questions which hinge around ideas to do with 'connection' and 'disconnection' and it uses these ideas in a straightforward opposition. In Avatar, things are very simple: connection equals 'good' and disconnection equals 'bad'. We see over and over again that the Na'vi, the indigenous people of the planet Pandora, are connected. They can make what's called 'Tsahaylu', a physical and mental link via a sinuous braid from the back of their heads to the plant and animal life around them; they can literally 'plug themselves into' their world. At the religious heart of the community, the 'Tree of Souls', they can make the same direct contact with the spiritual realm of their ancestors; in this, it's suggested, they can link themselves to god herself, to 'Mother Eywa', the 'deity' of Pandora. God seems to be presented in the film as something like the sum total of the interconnected network which is life itself: it is, 'a network of energy which flows through all living things'. The Na'vi are shown have an instinctive reverence for the spiritual and ecological balance of the world - and they know themselves to be a integral part of this greater whole. All is connected for them, all is one. There is no question in the film that such a connection, such a certainty, could be anything other than an entirely good and wholesome thing; 'Yes,' the audience are encouraged to think, 'we should all be like that'. The humans in the film, on the other hand, are disconnected: they are not at one with their objects and they search for what they lack - they are riven by aggressive and acquisitive drives. They search for profit from material goods by strip-mining for the priceless metal 'unobtainium' and in this they have a savage disregard for the ecological balance of Pandora. They are not connected and so they do not see - like the Na'vi can - that ecology touches on the divine. There is no question but that these are the 'bad guys' and the qualities of lack and disconnectedness are shown to be at the heart of what might be called their sin. The Na'vi possess - and the humans lack. The hero Jake Sully lacks the use of his legs. His confinement in a wheelchair makes him, for Cameron, something like an emblem for the whole human condition: disabled, he can't take the step that the Na'vi can into knowledge, connection and spiritual bliss. It is only thanks to the advanced neuro-technology of the science team that he can revel in the mobility that his Na'vi 'avatar' lends him and his re-connection and possession is a joy to him. He comes increasingly to see that the lack in his human life is what makes it worthless in comparison to the 'real' life he has with the Na'vi. Taking Cameron's hint from his own name, perhaps, he comes to view his bodily human life as one that is irredeemably 'sullied'. The Na'vi are literally at one with nature but Jake and his fellow humans can't take that step into sacred awareness, they are alienated in their lack and ignorance. With the ravages of their strip mines and the destruction of the forests their disconnectedness is shown to be nothing more than a stain on the paradise of Pandora. The only 'aliens' in Avatar are the humans, the only 'real' people are the Na'vi, the ideal beings who want for nothing, at one with their world in an eco-spiritual harmony. In keeping with the film's reverence for connection the only part of human endeavour in Avatar that's shown in anything like a good light is the work of the science team. The hard facts of their research, we're shown, can be grasped and held in exactly the same way as the Na'vi can grasp the fact of their own sacred relatedness. 'I'm not talking about some pagan voodoo here,' says Grace Augustine, the leader of the team, 'I'm talking about something real, something measurable in the biology of the forest.' 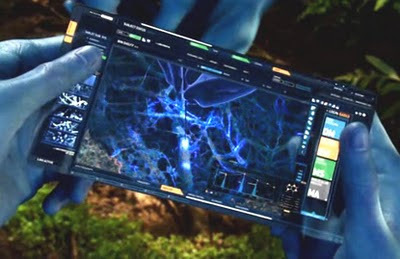 In Avatar, science can grasp the traces of the electro-chemical network that the Na'vi know themselves to be a part of, the web of connectedness which is god herself. In Avatar, science can grasp the traces of god's own life. So there's a central question in the film about what it is that gives people real authority. The science team and the military-industrial mining operation are in conflict; the great wealth produced via the precious metal 'unobtainium' funds their work but the scientists come to reject all claim upon them by external authority and flee to join the Na'vi. The step into knowledge and certainty is what gives authority in Avatar and the science team, like the Na'vi, are able, in some way at least, to take that step through the veil. Their knowledge of reality - of the world which is god herself - makes them something like a new priestly caste and, as such, they become sure they need bow to no merely human authority. In rejecting attempts by outsiders to question their god-given status they are presented to the audience as doing wholly the 'right thing'. The graspable facts that the science team can unearth and the hard-wired certainty of the Na'vi are presented in the starkest possible contrast with the venal, disconnected and unholy strivings of the other humans in the film. Authority is not with those who lack and search, the film tells us, authority is with those who are connected, those who possess, those who have the facts. These states lend an authority that cannot and should not be questioned. The humans in the film are shown to be searching - for profit, power and lost bodily integrity - but 'searching' in Avatar is presented in all ways as being of a lesser value to the state of 'having' and possessing. The Na'vi do not need to search for any form of salvation: for them, the veil has never fallen between their life and god's life, they are connected to their Mother Eywa, one with god and their world in a guiltless, pantheistic fusion. It is the humans who search for what they do not have and there is no question but that this quest of theirs places them in an inferior ethical category to that of the Na'vi. Again and again, in Cameron's world, 'connection' is all and 'disconnection' is little more than a snake in the garden of paradise. This theological motif is underlined in the latter part of the film when the military-industrial clan attempt to bomb the heart of 'Mother Eywa' at the 'Tree of Souls'. They are shown in effect as attempting the murder of god. To have a connection with god, the state of the Na'vi, is to be sinless; to leave one's home in search of what cannot be found, the state of the humans, is shown to be nothing less than sin itself: a threat to those who dwell in the garden of paradise, an attack on the life of god. So the Na'vi, Sully and the science team are shown to us as not so much being beyond question about giving responsibility for all sin to their opponents - it's more accurate to say that the very question itself is erased. If you try to kill god then there can be no doubt that you cede your right to true human - which is to say 'Na'vi' - status. All sin and guilt is obviously theirs and so all punishment is justified: the subsequent slaughter of the sinful, god-killing humans is presented as the entirely just retribution of the stainless Na'vi upon those who are are solely to blame for this blasphemous crime. 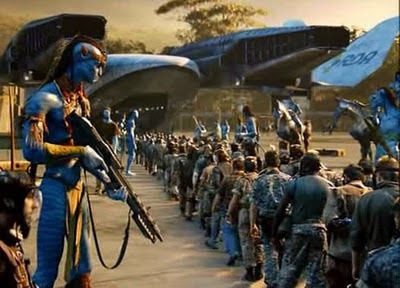 The attempt to bomb the 'Tree of Souls' is the second atrocity in the film; the first is the destruction of the Na'vi 'Hometree' and it is this cataclysm that becomes the unifying event that, under the leadership of Sully's avatar, serves to unite the disparate Na'vi tribes in a righteous crusade for vengeance. Sully's plea for help against the insurmountable forces that face them is heard by Eywa, by god herself, and in the exultant turning point of the film she causes the very life of Pandora itself, the fierce animal giants of the forest and sky, to join forces with the Na'vi and serve them in their rout of the godless infidel. With god, with mother earth herself on their side, the battle is won. The Na'vi and their allies then proceed to expel from the Eden of Pandora all the faithless, lacking and dispossessed less-than-humans that were not killed outright in the war. As we watch them being corralled by armed guard into the transports that will freight them away we are assured that this is a nothing but a spectacle of justice and one we can safely applaud. The aliens', we are told, 'went back to their dying world'. But this business of 'mother earth on our side' and the emphasis on the deep, physical-spiritual or indeed racial connection between a people and their land; does it not have some historical precedents which don't fit quite so happily with the caring and compassionate self-image that the audience is encouraged have of itself when it cheers for the victorious Na'vi? There are, for me at least, very powerful echoes in the film of just the kind of neo-pagan romanticism and mystical reverence for blood and soil that formed, for instance, the core of the Völkisch movement in 19th century Europe. The Aryan people, at one with their ancestral land and its old Norse gods; was this cult of blood and soil not arguably the set of ideas from which emerged the murderous ideology of the 'pure race' - the ideal beings who sought to cleanse their land of what they saw as the grasping and less-than-human parasites that despoiled it? The driving idea of an idealised 'connection' with nature, soil and the gods, certainly does have a very grim historical reality - but this is something that is not so much as even hinted at in Avatar. The humans are loaded into their transports and there's no question in the film that this might be anything other than an entirely just outcome. So there can be other ways of approaching the central ideas in the film but they are resolutely not raised as questions. In regard of the god-seeing science team, for instance, are there not just causes to sometimes question the political and social assumptions which even the most rigorous scientific research projects can still carry as a driving force in their work? We may certainly not side, say, with those who refuse any of the claims of the research that asserts the factual nature of global warming - that'd be a failure of trust that verges on paranoia. But if that's so then it's a similar delusion to believe that it's possible for us to grasp material from a pure realm of fact in a way that's beyond the influence of any kind of political, personal or social bias - to treat facts as in effect, god-given. In Avatar, however, this question is wholly overlooked: the science team and the Na'vi know, they have the real in their hands and the authority this lends them is shown to be utterly beyond any legitimate inquiry. Just as the supposedly unquestionable 'reality' of a link between an indigenous people and their land of origin can be used to justify a policy of outright hostility to those they deem outsiders, so too can a scientific cause become so blinkered by its own axioms that it condemns as heretical anyone who dares call them into question. If I ever got pneumonia, I'm sure I'd be grateful to take the antibiotics; but I'd also be grateful to be allowed the right to disagree, for instance, with the growing body of medical authority whose research has 'discovered' that childhood is, in effect, a pathological condition the only cure for which is a life-long course of anti-psychotic medication. Research findings are not god-given; disagreement is not blasphemy. So too with the idea of the physical link 'Tsahaylu' that the Na'vi can make with their world. They are a connected people: they do not need to search for anything because they have their joy to hand: they can simply plug themselves in and savour the bliss of being one with 'Mother Eywa'. They have their blissful life at home with the source of all their pleasure and we, the audience, are persuaded that this is indeed a picture of the good life, the life we should all be living. But perhaps there's another way to approach this idea too? In what way, really, is this bond that the Na'vi enjoy actually any different from what we understand to be fetishism? A fetish is a finite, knowable, graspable thing which allows us to refuse the challenge and questions that come from loving an 'other'. When we fetishise something we take a step which certainly allows us to grasp a limited object, but only at the cost of turning ourselves away from a greater mystery, from that which can't simply be grasped as 'a thing'. If we do this, we choose not to risk the encounter with an 'other', we are connected to our object and all we seek is already grasped in our own in-reaching hands. So in what way is this intimate connection that we are supposed to admire in the Na'vi any different to this? The only real difference that I can see is in the direction of the spin that's been applied. Just like romantic nationalism and scientific authoritarianism, in Avatar, fetishism is simply loaded with glittering CGI lights and lauded as an unquestionably 'good thing'. 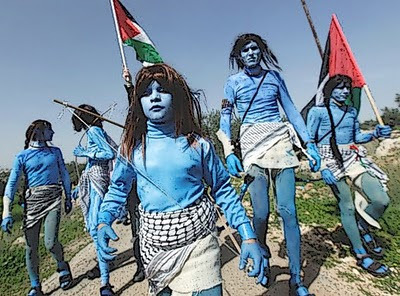 I've recently seen photographs of Palestinian protesters who have dressed themselves up to look like the Na'vi. Perhaps they were identifying themselves with the blameless blue underdogs who, outnumbered and out-gunned as they were, nevertheless managed to triumph over the formidable military might that faced them? On the face of it, the film can be seen to support such an interpretation - but I'd argue that this is far from being the only possible reading of the film's political message. 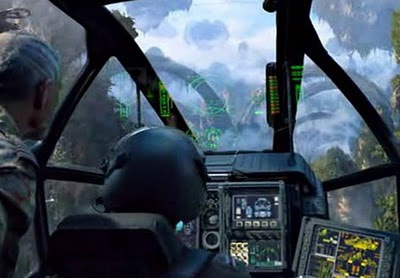 The attack on the Na'vi 'Hometree', for instance, is treated in such a way as to carry references to the 9/11 terrorist atrocities in the States. 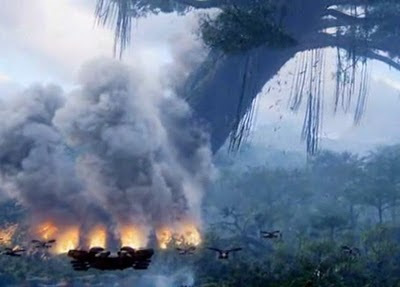 The towering home of the Na'vi crashes down after an assault from the air; smoke, flame and embers swirl around the terrified survivors as they flee through the burning forest. Who can see this and not have evoked for them images of ashen and horror-struck New Yorkers running for their lives as debris from the collapsing World Trade Centre rains down around them? So are the Palestinians wrong? Is the film 'really' a rallying cry for a 'war on terror' by the unjustly attacked United States? You can read the attack on the tree in this way, but the film doesn't insist on it. There's nothing which stops such an understanding but, equally, there's also nothing in it which prevents a similarly useful reading being made by those Palestinians who might wish to see themselves as blameless victims of an expansionist Israeli state or, come to that, by Muslim Jihadists looking for support in their struggle against the 'Great Satan'. 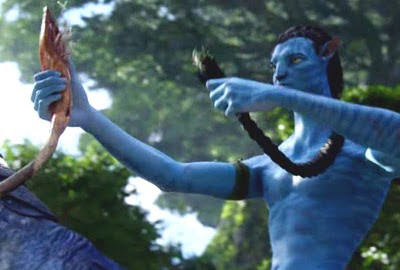 Avatar is a genuinely 'equal opportunities' film: it allows and encourages anyone engaged in a political struggle to identify with the Na'vi and view themselves, like them, as pure victims of an inhuman foe. In other words, if you want a near-sighted solution to a political problem then Avatar is here to help you. It doesn't much matter who the evil 'other' might be - all are free to identify with the blameless blue heroes. American, Israeli, Palestinian, Jihadist? No problem: you're right, they're wrong and they shouldn't be on your land; god's on your side, after all. Avatar then is that perfect commodity: a brand that can be sold world-wide and which will adapt itself with ease to all the varied political situations in which it appears. There's no nation on earth which can't dress itself up in its dazzling, one-size-fits-all costume of aggressively nationalist self-righteousness. The Na'vi have to have all of the living space, all the Lebensraum - there's no room for difference on Pandora - and they are utterly right to kill or expel anyone who disagrees with them. This is a creed which will sell in any country on Earth; it's always been a popular 'solution' and it always will be. But to say that it's popular is not the same thing as to say that it's right - because it simply isn't right: it's wrong. Any of this by itself would be enough to show Avatar as the cynical and amoral picture-show that it is - but this is not the end of it: the crowning obscenity is saved for the final scene. We are human because we lack - not in spite of it. If we delude ourselves that we are one with what's right, if we become perfect in our own eyes and certain that we hold within our own hands the source of all knowledge and the proof of our justification by god, then we do nothing but fall in love with a beautiful but sterile and lifeless ideal. To maintain this perfect state of imaginary completion we are forced to deal death to every last thing which begs to differ with us in our madness. So to fall in love with this image, this ideal, is to fall in love with death itself. In the Greek myth the beautiful youth 'Narcissus' becomes so entranced with the perfection of his own reflection that he refuses to hear the voice coming from beyond the mirror, the voice of 'Echo' who calls to him as the life of the world; he chooses instead to realise his fusion with the mortifying ideal by joining it forever: he starves to death. Avatar, faithful to its love of the ideal, closes with a fitting salute. In one grand, final, and of course, beautifully presented gesture, Sully joins the Na'vi for good and bids goodbye forever to everything in his bodily human life that was sullied, lacking, compromised and incomplete. How does he do this? He kills himself. So Avatar's love of death unmasks itself and we, the audience, are encouraged to weep and agree that, yes, this is indeed a perfect consummation, devoutly to be wished; 'Oh, that we could follow him', we are urged to think, 'if only we too could shuffle off our poor, sad, finite human lives'. Love the questions you've raised here, Hubert! Posted on my Facebook after readinf your commentary: though Avatar had a script built around special effects, it still is such a marvelous piece of filmmaking that it truly deserved the Oscar. We knew Hollywood had made up its mind to promote The Hurt Locker via multiple Oscar wins as it is all about generating capital. The Rock & Roll Hall of Fame is more a sales tool ...than an acknowledgment of important art and the artists that make it. Hurt Locker is not inspiring as many comments as Avatar...it is Avatar that has made the bigger impact. Maybe it’s not about the binary. Let me be more precise: maybe the interplay at the heart of the film overflows the either/or binary of connected vs. disconnected!? Maybe it’s more about the mediated intensities of interconnection and the meaningful differences (interstices) between them? There is a message in the film that is expressed through the dialectic of conflict between science/military and the Na'vi forms of life. This is symbolized by the “conflict” at the core of the narrative and the cross-over resolution/integration in the end. I thought these more subtle resonances about mutual relationship and mediation that individuals partake in and must navigate were important – as opposed to any simplistic notions of complete connection vs. complete disconnection. There is also a lot of critical things we could say about the worn out trope of blaming Western culture for “inventing” and applying everywhere the noble savage image. The fact remains that many aboriginal societies ONCE WERE, in at least some ways, better off than how they are now, and better adapted to their environments than we post-moderns. Being too quick to attribute deep ethnocentrism to everything the big bad white man does can often lead to an ideological overlooking of the actual evidence. Non-capitalist societies did have a high degree of dignity and were in fact “noble” in many ways before my ancestors and others committed genocide. Marshall Sahlins details the many ways in which these ‘savages’ were the “original affluent societies” in his seminal studies of hunter-gather societies. I think many critics of Avatar miss the very explicit point of the movie: there are healthier and more mutually enhancing ways of being-in-the-world than the way we currently exist. The Na’vi aren’t just a throw-back to some sort of 'primitivism' but explicitly contemporary WITH the invaders. Their world is every bit as complex and dangerous, just that they are more adapted to it. You might say that they are meant to represent the future, what might be possible, instead of being simply a projection of what Cameron thinks the past was. It’s an ethnocentric view to assume that we would have to ‘go backwards’ in order to be like the Na’vi, when in fact their society is much more ‘mature’ and ‘advanced’ than the science team was even able to imagine. Very interesting read, and I appreciate that you took the time to go this deep into what has generally been considered a vapic, but very watchable, film. Gah that's "vapid." So much for a quick comment without preview. Most thoughtful thing I've read about Avatar so far. Very nice! I've not seen the movie and had formed some impressions about its weaknesses, but your analysis is very thought-provoking. It almost makes me want to see it now. But I think we'll stick to our plan and wait until it comes out on on-demand. Many thanks to all of you who have not only been so kind as to read this lengthy post but also kind enough to put your responses into writing. I'm very grateful for all comments. michael~ 1. My thoughts are 'simplictic' and yours are 'more subtle'? I don't honestly think that makes a good enough argument by itself. michael~ 2. You put your position in a sophisticated way, but in essense I think you're committed - as are we all, in some measure - to the notion of 're-connection' as a motiviating social/political ideal. I think that it's the very act of 'imagining a future' that's overdetermined by fantasy ideas of 'connection' in Avatar. I'm also saying that I think that these fantasies are romantic & highly questionable and have had very definite and very grim historical precedents when put into action in the past. Not surprisingly, a fellow I know who has a good many Native American friends reports that many of them loved the movie. As you point out, though, the role of the Na'vi (any accident that the name is so close to "Native"?) is easily adopted by almost any group. A fantastic post, you are without doubt one of the best bloggers from the UK. I have to echo Holly, your analysis is far more thought provoking than anything I'd read so far. Have you read Jeremy Narby's "the cosmic serpent-DNA and the origins of knowledge"? I'd love to hear your thoughts . Tovar: Yep, it's a popular film all right; it's easy to love the idea of ourselves as the noble & innocent ones. The cosmic serpent-DNA and the origins of knowledge? Well, we crazy folk know our own - and this guy is one of us for sure. At a basic level the film was about the "culture" of death versus the culture of life. It is therefore interesting to note how many conservative religionists loathed the film. I enjoyed the film because it resonated with these essays by a Real living-breathing-feeling Avatar. Plus 2 comments on the film. Although Sully tried to help the Navi, there resistance was well and truly defeated. It was only when the powers of "nature" intervened that the techno-barbarians were defeated.Powers that were invoked by the Navi prayers to the primal spirit power(s) that ruled their planetary eco-system. Plus the Avatar did not emerge/appear until the very last part of the film when the lifeless body of the former Sully awoke to a completely new identity. An identity which implicitly incarnated both the Navi and human world-views.